WHITE HALL — Bryant’s Chris Joiner made like a Hall of Famer with the same number (24) when he led off the Hornets’ game against the White Hall Bulldogs on Thursday. On the first pitch he saw from right-hander Matt Taylor, Joiner blasted a drive into the pines beyond the high outfield fence at the White Hall High School field. Now 9-0 overall, the Hornets advance in the winners bracket of the annual Billy Bock Classic. They’re set to play Friday at 6 p.m., against the winner of a late Thursday game between Lonoke and DeWitt. Joiner added a bunt single during the game and Jordan Taylor continued his hot hitting with a 3-for-4 day in support of right-hander Caleb Milam. Taylor improved his team-high .444 batting average to .484 and, with two runs batted in, increased his team-high total to 13. Over five innings, Milam shut out the Bulldogs on just three hits, improving to 3-0 on the season with the win. His earned run average shrank to a miniscule 1.02. Dylan Cross got the final six outs in relief, surrendering the lone White Hall run in the bottom of the ninth. The Hornets went ahead and scored three runs in the first inning but it could’ve been worse for the Bulldogs. Garrett Bock drew a walk and swiped second. He took third on Hunter Mayall’s hard grounder to first but held on Brennan Bullock’s pop to right. Taylor, however, came through with the first of his three singles to make it 2-0. Brady Butler looped a single to left then Landon Pickett grounded through the left side for a base hit that loaded the bases. Lucas Castleberry worked an RBI walk but Taylor escaped after that with the bags still full. In the bottom of the first, Milam worked around a two-out single to Josh Guy, who wound up with half of his team’s six hits in the game. In the second, the junior right-hander struck out the side. After getting through the top of the second unscathed, White Hall’s pitcher ran into more trouble in the third. This time, Bryant’s Taylor instigated an uprising with a single up the middle. Butler got a nice sacrifice bunt down the Pickett hustled to first to reach on a third-strike wild pitch. With runners at the corners, Pickett stole second as White Hall ran a cut-off play to make sure Taylor stayed at third. Castleberry served a single into right to drive in his second run, making it 4-0. 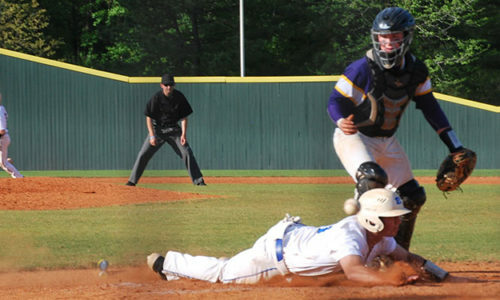 Caleb Garrett drew a walk to load the bases and, an out later, Garrett Bock hard grounder to third was speared by White Hall’s diving third baseman Brad Bethea. He tried to lunge at Castleberry coming into third but couldn’t get the tag on him as Pickett scored. Milam issued a pair of walks in the third then worked around a walk and an error in the fourth. He continued to show a knack for working out of jams in the fifth. The Hornets had increased their lead in the top of the inning. Garrett had walked again and Joiner beat out his bunt hit. Bock grounded into a force at second but beat the relay to first, setting the stage for Mayall’s long sacrifice fly to left that made it 6-0. Bock stole his second base and scored on a looping double by Bullock. Taylor capped off the inning with a bloop single in right center to make it 8-0. Going into the bottom of the fifth, Milam had only surrendered the one hit to Guy. In the fifth, however, Skylar Hobbs singled to left. A walk and a one-out single by Guy loaded the bases for Bethea, the clean-up hitter. But Milam got him to pull a bouncer to third that Castleberry made a sparkling play on, throwing home just in time for a force. Milam then got his mound counterpart to ground to Pickett at first to end the threat. Cameron Stone relieved for the Bulldogs in the eighth and worked around a base hit by Garrett. Cross, likewise, eased through the inning around a walk. In the seventh, Garrett Bock slammed a double hit off the fence in left. He took third on a wild pitch and scored on Bullock’s grounder to short. Three singles and a groundout produced White Hall’s run in the bottom of the inning but they stranded two as Cross got the final out on Dylan James’ pop to second. E—Castleberry. LOB—Bryant 11, White Hall 11. 2B—Bullock, Bock. HR—Joiner. S—Butler. SF—Mayall. SB—Bock 2, Pickett.